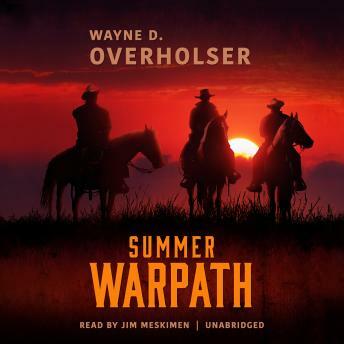 The summer warpath began in late spring 1876 and was one laid out under the command of General George Crook, perhaps the most experienced Indian fighter in the United States Army at that time. Among other officers under Crook's command was the daring and resourceful Lieutenant Colonel George Armstrong Custer and the 7th Cavalry. The purpose of the campaign was to round up the wild tribes of the Cheyennes and Sioux and place them on reservations.Walt Staley is a drifter, a man who works only long enough so he can get enough money to be traveling again. He rides for Fort Laramie, where he successfully enlists as an Army scout under General Crook. Before Staley arrives at the fort, he is forced by roving Indians to stop at an Army hay camp, where he meets Dave Allison. The two become friends, especially after Allison is transferred to active service under General Crook.Finally, there is Patrick O'Hara, who considers himself the ace reporter at the Chicago Herald. He wants most of all to be attached to Custer's regiment, believing that Custer alone will be able to subdue the wild Indian tribes. He is disappointed when his editor instead sends him to be attached to General Crook's expeditionary force.The events that follow will change the lives of these three men forever.